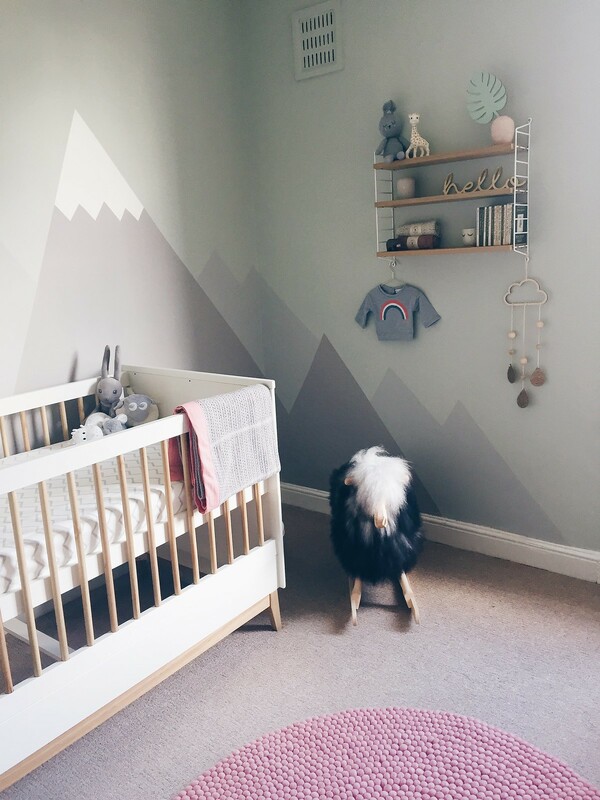 Baby A’s nursery was one of the first things I started planning when I found out I was pregnant. I’m shallow, I know. 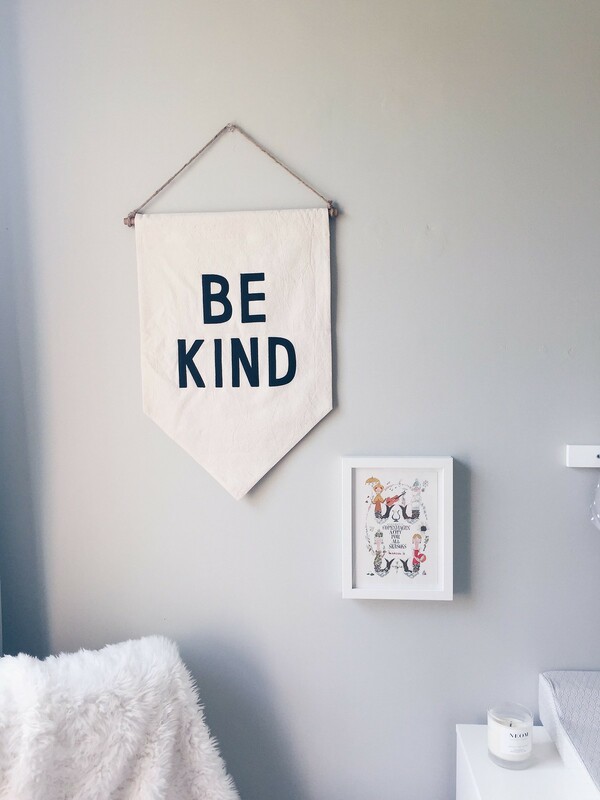 But I do love an interiors project and there’s endless nursery inspiration to be found when you’re battling morning sickness and browsing Pinterest. I went back and forth with a few different ideas before settling on a style. I didn’t want to go super girly with lots of pink, but I do actually like pink and think it works really well to create a soft, calming space. 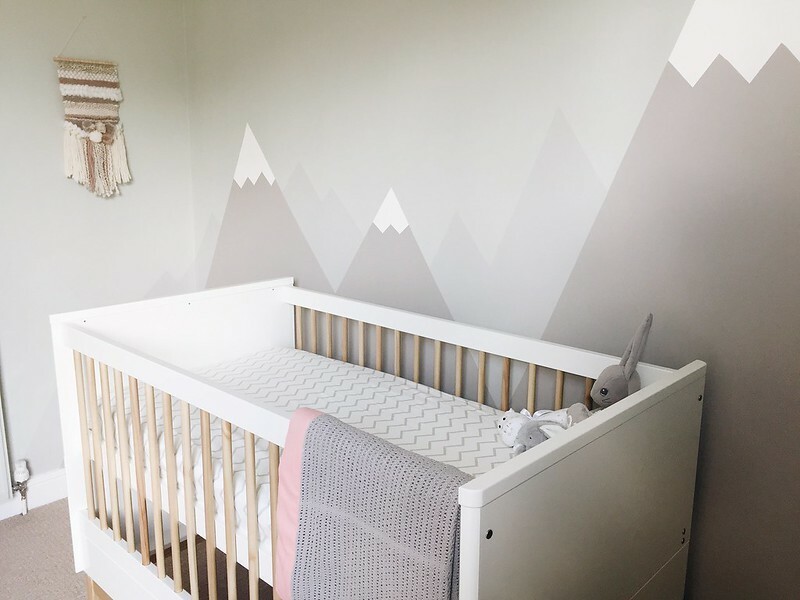 I fell in love with Emily Henderson’s blush and green nursery theme and searched high and low for an affordable alternative to that beautiful forest wallpaper, to no avail. So I toyed with decals and feature colours and printed wallpaper before discovering the mountain mural. Our first job was to clear the room and paint. Before its nursery transformation, this room was used as Rob’s office/a storage space/a general dumping ground, so we got rid of all the clutter and cleaned top to bottom. Three of the walls were light grey and one a slightly darker shade, so we used a primer on the darker wall then went straight in with the main colour, which is Farrow & Ball’s Cromarty. It took three coats to get an even finish, then we moved on to the woodwork (Dulux’s Eggshell White wood paint) and the ceiling. 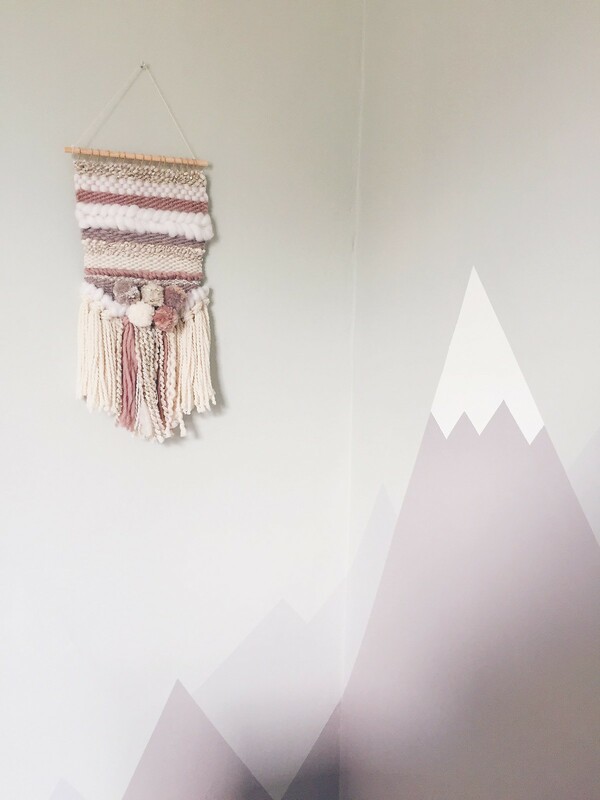 For the mountain mural, we used this tutorial and it was all very easy, if quite time-consuming. 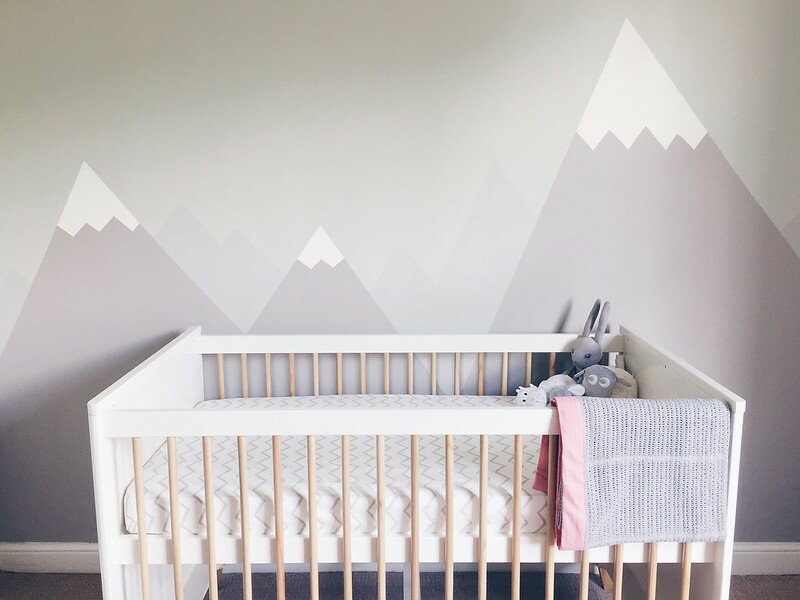 I’ll do a full post on the creation of the mural complete with progress pics, but for reference we used Farrow & Ball’s Dove Grey for the foreground mountains, Pavilion Grey for the background mountains and Wimbourne White for the snowy peaks! 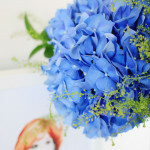 With the painting done, it was time to fill the space with beautiful, beautiful stuff! Being six months pregnant and all, I wasn’t much help with the painting stage, but I SMASHED the buying stuff stage. 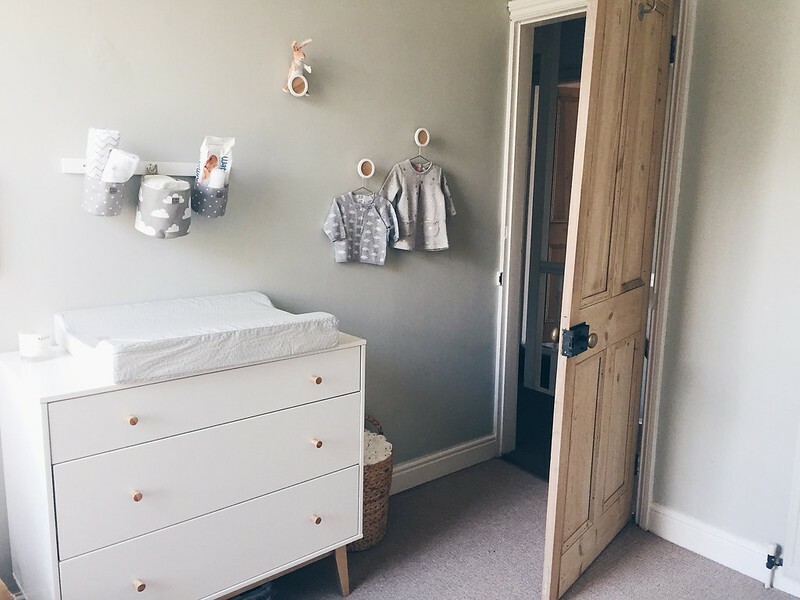 We started with the furniture – I knew I wanted a Scandi-style cot and a chest of drawers rather than a changing table, but it took a long time to find anything in the UK. US readers, you have it so great when it comes to nursery furniture! I loved the Babyletto range at Target but they don’t ship furniture over here, so it was back to the drawing board. I finally stumbled across the Finley cot and 3-drawer chest on the M&S website, of all places. 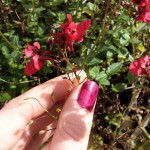 I’d never think to look in M&S for furniture, but both pieces are really well-made and they were assembled by the delivery team – much easier than Ikea! 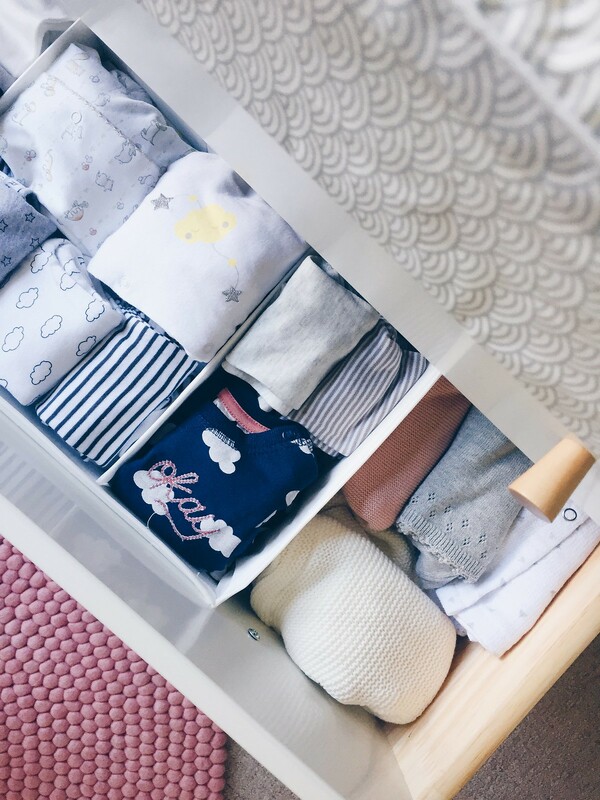 A little note on using a chest of drawers as a changing table – I didn’t want a wardrobe in the room, so the changing table needed to double up as somewhere to store Baby A’s clothing, too. 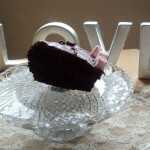 I also wanted something sturdy and high enough that I wasn’t hunching over it every time I changed a nappy. 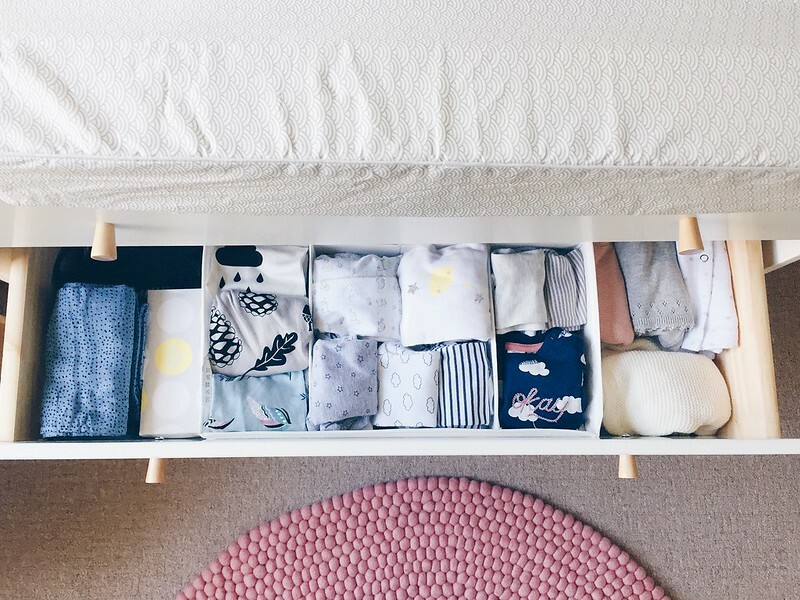 I read loads of reviews on various ‘changing chests’ but in the end decided I didn’t really need something that was designed specifically for changing – a substantial changing mat (mine is this Cam Cam one from ScandiBorn) seems enough, especially as I’m not gonna be wandering off while my baby lies untethered, mid-change. But if, when we get going with this baby thing, I find I do need a bit more support for the mat, M&S do a changing topper. Clever! 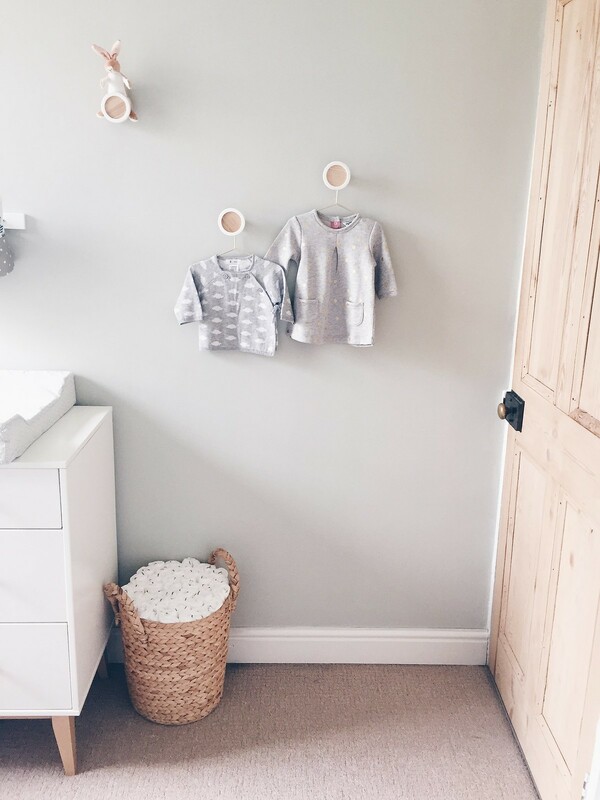 I also wanted to add some hanging storage to the walls to create a bit of a feature – for above the changing table I used the Farg Form hooks and hanging baskets, and added these round buttons from John Lewis to display some of Baby A’s clothes. Finding a nursing chair was another point of contention – nursing chairs are extremely ugly and I hate them all. Other than this £795 version (lol, why) I couldn’t find a single chair I liked, so I did what anyone who’s hit a wall during an interiors project would do – I went to Ikea. I’d read great things about the POANG chair for nursing purposes and at £55 it’s far more affordable than most ‘proper’ nursing chairs, so I snapped up the non-rocking version in the grey/oak colourway. It does actually rock a bit, and it’s more upright than the rocking chair which felt more useful for nursing. 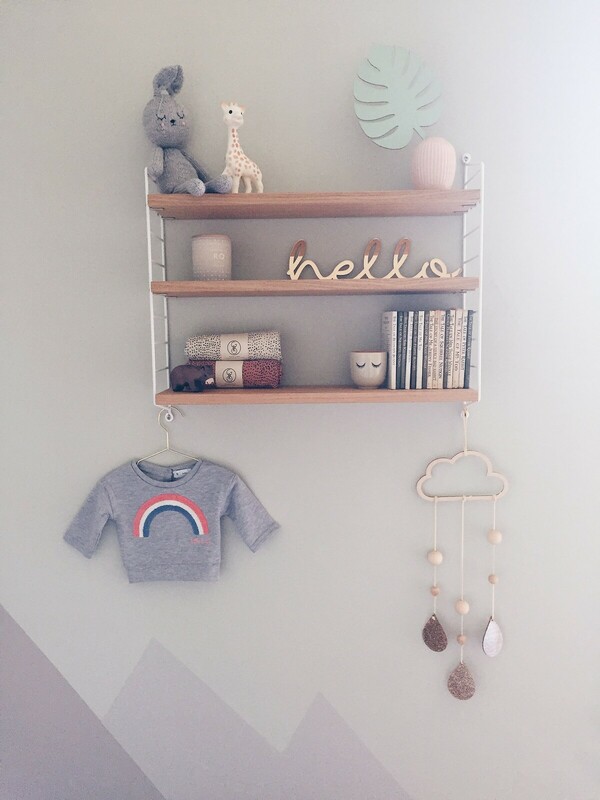 To display some of Baby A’s trinkets, I copied every New Mum Instagrammer and bought some String shelves. 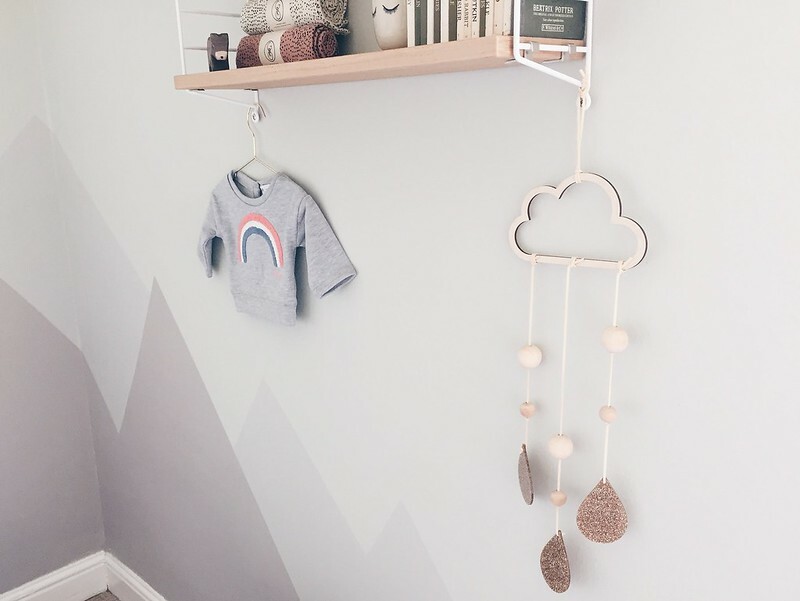 These are seriously popular in the nursery interiors community (yep, that’s a thing) and the oak/white version matches the rest of the furniture perfectly. 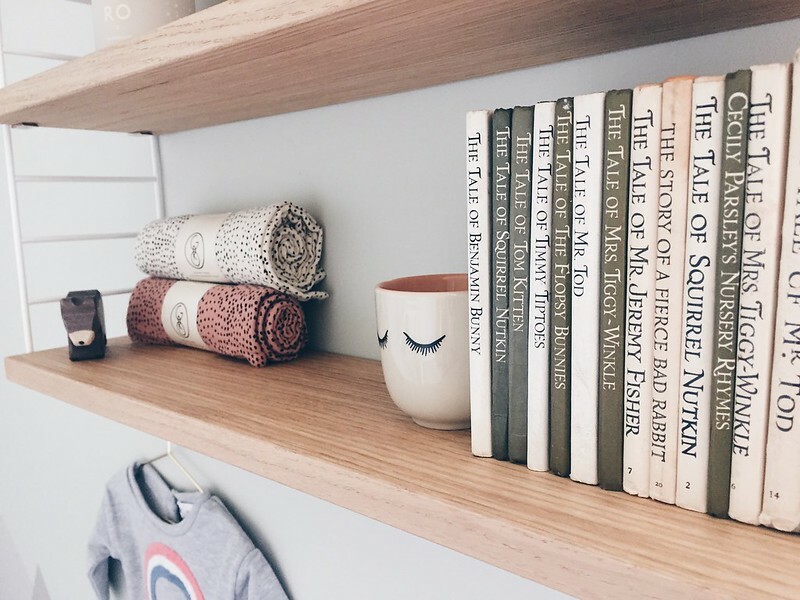 I don’t want lots of clutter in the nursery but these shelves are great for holding the bits and bobs I want to display, like the vintage Beatrix Potter books that were mine as a kid, the Lala Loves Decor acrylic pieces and every baby’s favourite giraffe, Sophie. For my baby shower, my wonderful friends and family all bought Baby A their favourite book from childhood. So cute! I wanted them out for all to see, so picked up a cheap picture ledge from Ikea and sat them all on it along with the light box that seems essential for all nurseries. 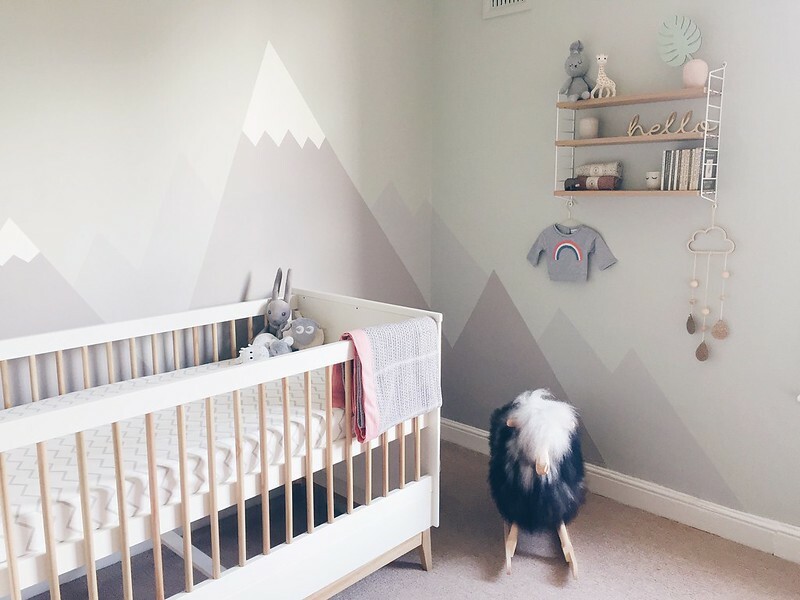 Instagram has been an amazing source of cool interior brands for project nursery – I discovered Secret Holiday Co’s amazing felt banners and Holly and Teddy’s beautiful weaves during my extensive browsing. 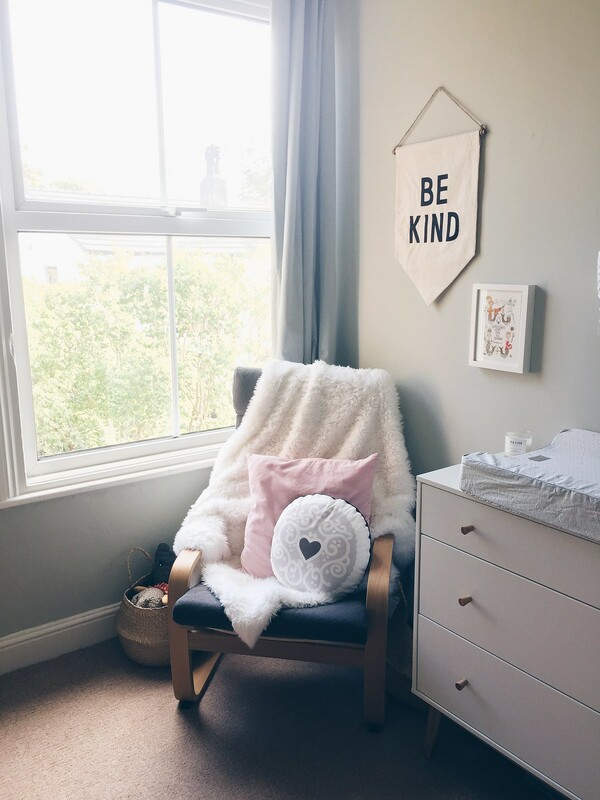 I think the finishing touches really pull the nursery together – the felt ball rug adds a hint of pink without being super girly, and the conical lightshade from Made.com matches the wall colour perfectly. I also found these black out curtains to keep the room dark when Baby A is napping during the day (fingers firmly crossed on that one). Finally, taking pride of place in the room, is Sven the rocking sheep. 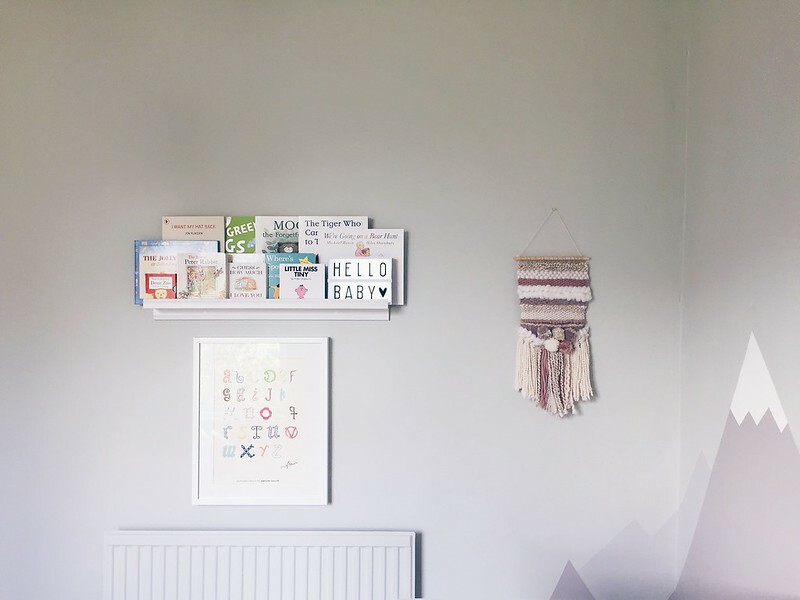 You might remember his Danish brother from our Copenhagen Airbnb – as soon as I spotted him, I knew he’d be the perfect addition to our Scandi-inspired nursery. Handmade by Danish designer Povl Kjer, these rocking sheep are really popular in Denmark and we saw them in plenty of shops but getting one back in our hand luggage would’ve been tricky. When we got back from Copenhagen I made it my mission to find a stockist in the UK and luckily discovered Gigi Brooks, who sell a range of Povl’s designs (including his amazing sheep stools!). The lovely people at Gigi Brooks sent Sven out super quickly and he was the first piece to go into the nursery. I can’t wait to see Baby A rocking away! And so, that’s the nursery. All ready for her arrival in 5 (ish) weeks. Although she won’t go into her own room for around 6 months, I’m so glad we went through the ritual of preparing Baby A’s space, and I hope she loves it as much as we do. 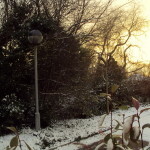 I’ll second Louise’s comment – that it all looks so DARLING, what a wonderful word to describe it. 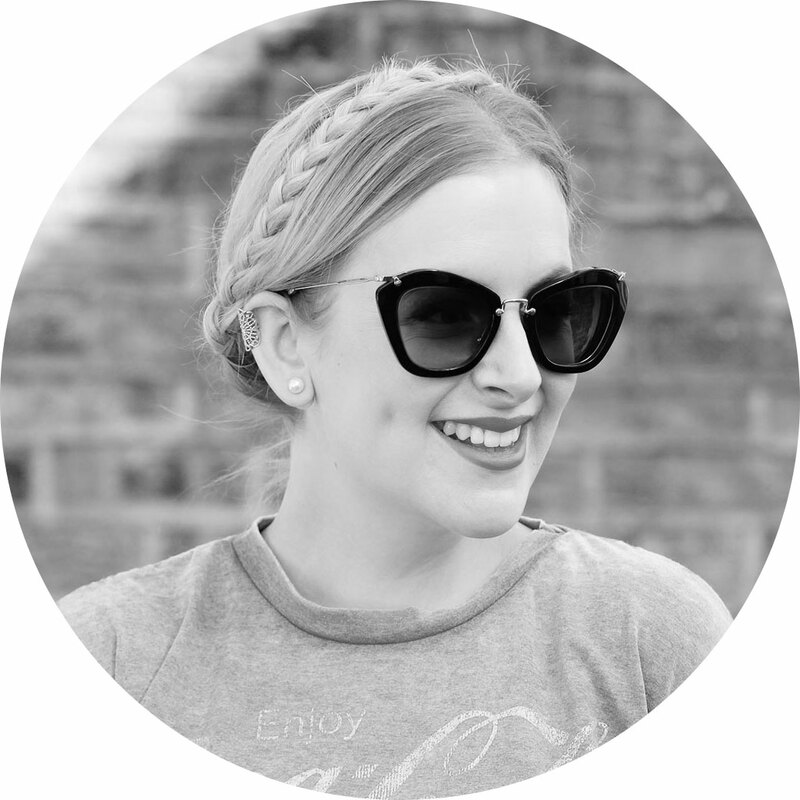 The nursery is like you & Rob, beautiful, kind, loving and ultra imaginative .. and DARLING, of course!